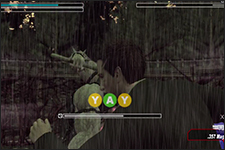 Below are my strategies for defeating the bosses in Deadly Premonition. Needless to say there are some major spoilers! 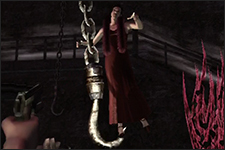 Attack #3: When a horn sounds large hooked chain will decend from the ceiling. Thomas will step aboard and ride it as swings directly into Emily. To dodge just push the three button combo that flashes on the screen. 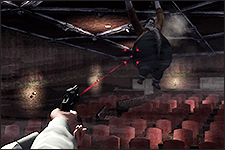 During the Map to Psychic Spot C Side Mission Thomas will go down in 5 direct hits from the Magnum. Attack #3: If York is too close George may grab the agent. Hit a three button combo to avoid being thrown onto the ground when prompted. If you fail you must wiggle the left analog stick to avoid George’s axe swing. George is only vulnerable on the scars on his back which are unfortunately only exposed briefly after he attacks. The magnum is best weapon to use during this fight since it’s the strongest firearm and it’s easier to target the limited area at a distance and prevent getting caught in a quick time event. To get in a good shot hold your ground and wait for George to charge forward. Side step his attack by hitting the bumpers, then complete a quick 180 and shoot his back once it is exposed after his initial axe swing. Be careful though, if you are too close to George a quick time event will occur which will cause York to dive off to the side and you’ll miss your chance to shoot. Another good opportunity to hit George is when he stands still and taunts York. 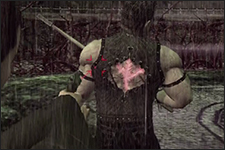 Listen for the sound of his axe hitting his hand then run around and target his back before he moves. 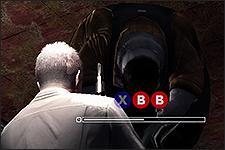 Using the magnum you can deplete George’s life bar in just six direct hits. George is a bit tougher during the Map Quest C Side Mission and will take eight direct hits. Attack #3: If York is too close George may grab the agent. Hit a three button combo to avoid being thrown onto the ground when prompted. 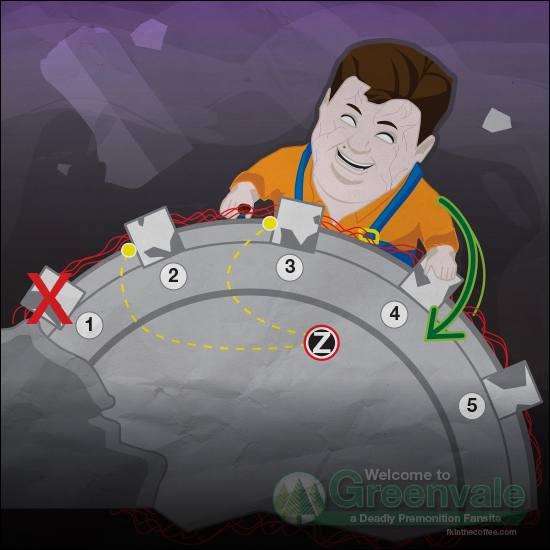 If you fail you must wiggle the left analogue stick to avoid George’s over the head axe swing. Continue using the magnum and repeat the offensive tactics used during the first phase of the battle. His life bar should completely deplete after six direct hits. George is a bit tougher during the Map Quest C Side Mission and will take eight direct hits. This last portion of the battle is super easy. George stands in place and throws the axe towards York. 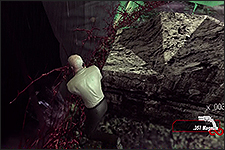 Switch to the machine gun and shoot the axe as it flies toward York’s head. Once you hit it enough times the axe will change direction and fly directly into George’s chest. This battle is simple but a bit tedious since it takes quite a bit of ammunition to take Kaysen down and he’s only vulnerable briefly in certain positions. It also doesn’t help that the most powerful range weapon in your arsenal, the Infinite .374 Magnum, only holds four bullets at a time so you’ll only get a few shots in while Kaysen’s vulnerable before you are forced to reload and the time window to inflict damage has closed. First thing you want to do is make sure the Weather Doll is in the upright position in your inventory so Zach’s health will slowly reload if he is ever hit by one of Kaysen’s attacks. Shoot Kaysen 1-2 times with the magnum and make him drop from ceiling. Since his back is invulnerable it is best to wait until Kaysen is facing Zach straight on before taking any shots so you won’t waste time and bullets shooting him with no effect. You’ll know when you’ve made a direct hit on Kaysen when purple blood spurts out of him from where you made a shot. Once Kaysen falls to the floor to he’ll perform his roll attack so reload your gun as soon as he lets go of the ceiling then be ready to move out of the way as soon as he shoots towards Zach. If you are successful in evading the Kaysen’s roll attack he’ll land in the middle of the front row on his back and struggle briefly to get back up. While he’s in this vulnerable position lock on an fire at him. 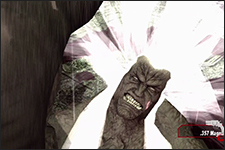 It’s possible to get at least four direct hits before Kaysen returns to the ceiling and repeats his attack cycle. 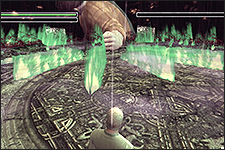 Using the magnum it is possible to deplete Kaysen’s life bar after 50 or so direct hits during your first encounter. Kaysen is a bit tougher during the Map Quest C Side Mission so it will take 50 or so direct hits. Since you only have to run for the most part during this sequence it may seem like a piece of cake but like the previous Raincoat Killer chases Zach’s movement is unfortunately controlled by wiggling the left analog stick side to side… which you will have to perform constantly for roughly 3 minutes before to making it to the exit. 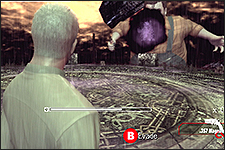 The best strategy in this fight is to immediately turn the Weather Doll in your inventory upside down so Zach’s health will slowly reload if he’s hit then pause the game every now and then to give your hand a break from the frantic side to side motion. Attack #1: When Kaysen says “Take this and die” he’ll reach down and swipe his left arm across the ground which releases a green energy attack that splinters into several different directions. If you are near Kaysen when this attack is unleashed Zach will be knocked onto the ground by the initial shock wave and be unable to move momentarily. To evade this attack you must move a safe distance away from Kaysen as soon as he begins the phrase to prevent being knocked down by the initial shock wave then stay out of the direct trajectory of the energy that’s unleashed. Attack #3: Shortly after Kaysen turns and hides the doll in his front overall pocket he’ll yell “This is the end, Zach” then slam his left first into the ground and release another green energy attack. If you are near Kaysen when this attack is unleashed Zach will be knocked onto the ground by the initial shock wave and be unable to move momentarily. To evade this attack you must move a safe distance away from Kaysen as soon as he begins the phrase to prevent being knocked down by the initial shock wave then stay out of the direct trajectory of the energy that’s unleashed. Before you attack Kaysen make sure the Weather Doll in the inventory is turned upside down so Zach’s health will slowly reload if he’s ever hit. Kaysen is only vulnerable through the small doll clutched in his right hand which unfortunately is a bit hard to target at a distance so you you’ll have to get pretty close to the guy. 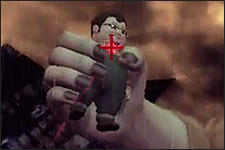 With the magnum equipped aim at the doll’s face and chest and fire only when the cross hairs form a cross. Unfortunately auto aim is useless in this situation since it will only target the large and invulnerable Kaysen and not the doll. When you’ve made a direct hit you’ll see purple blood spurt from the doll and the large Kaysen howl in pain. 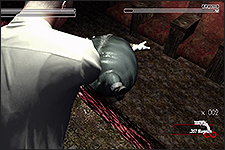 The doll is briefly invulnerable during Kaysen’s pain animation so use this time to reload your gun and only take additional shots once he has settled back down. 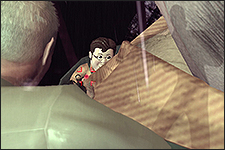 If you had to purchase a Magnum from Panda Bear because you neglected to complete Side Mission #11 you may be running low on ammo by this point. 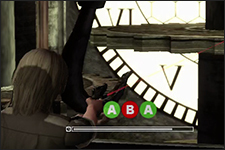 Luckily there’s two boxes of [.357 Magnum Bullets] and three boxes of [5.56mm x 45 Bullets] hidden within the boxes scattered around the roof of the clock tower. Kaysen may even end up breaking a few of these boxes open for you when he deploys his energy attack. 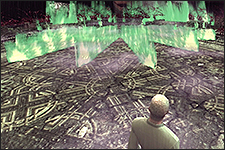 Speaking of which… his green energy attacks are pretty annoying given their frequency and the need to move a safe distance away from Kaysen to evade. 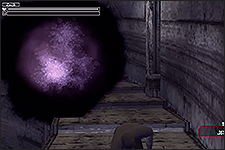 Since it is hard to target the doll at a distance you’ll waste time returning to Kaysen’s side again and run the risk of a repeated energy attack before getting more than a few shots into the doll. Though honestly you probably won’t have to guide Kaysen back to the right too often as he generally stays near the center of the area for most of the fight. 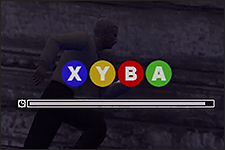 Kaysen’s lifebar should deplete after approximately 24 or so successful shots into the doll though it he’s a bit tougher during the Map to Psychic Spot C side mission and will take around 34 direct hits. Once this occurs he’ll turn his back to Zach and hide the doll in his front overall pocket. When the doll is safely tucked away Kaysen will yell “This is the end, Zach” and slam his fist into the ground and release another energy attack. As soon as Kaysen turns equip the infinite 10mm Machine Gun. After he slams his fist down dodge the resulting energy attack then climb onto his fist and run up his arm. Once you are on his shoulder aim the gun down at his chest and spray the top of the overall pocket with bullets IMMEDIATELY. To end this fight you only need one bullet to hit the doll which is quicker to achieve with a wide spread of bullets over the entire pocket area.